We received many qualified applicants for the 2018-19 CADRE Fellows program and will announce acceptances in our October newsletter. Thank you to applicants and nominating awardees! As a reminder, if your project has new resources, a new website, or other news to share, please let us know at cadre@edc.org. 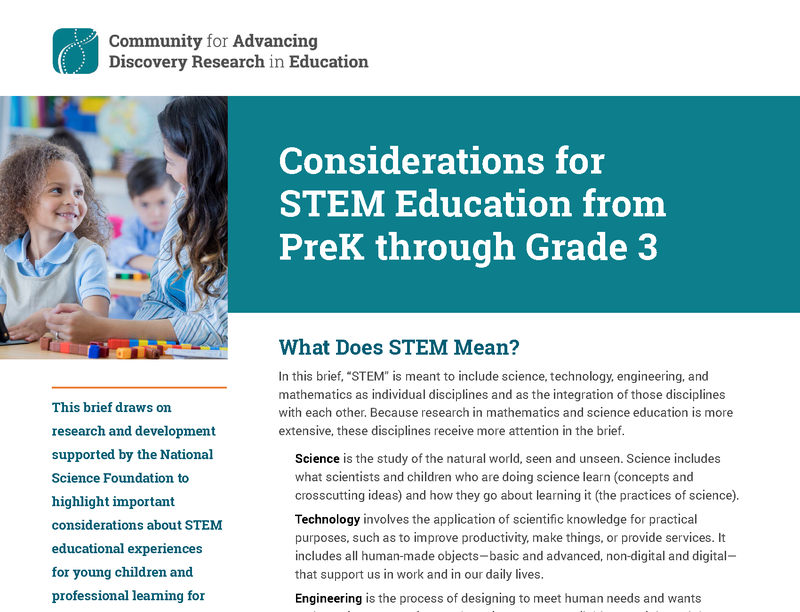 The DRK-12 early learning topical group (co-chairs: Doug Clements and Julie Sarama) has produced a brief that draws on NSF-supported research and development to highlight important considerations about STEM educational experiences for young children and professional learning for educators who provide those experiences. Please share the brief with curriculum leads, principals, superintendents, and others throughout your education network. Congratulations to this year's DRK-12 awardees! We look forward to getting to know you and hearing about your work as it progresses. Welcome to our community! NSF Program Directors Robert Ochsendorf and Karen King led two webinars on the DRK-12 Solicitation (17-584), addressing the solicitation and proposal preparation process. As a reminder, the submission deadline is November 14, 2018. The webinars' slides and recordings plus additional proposal resources can be found in our NSF Proposal Toolkit. Are you new to research on broadening participation? Read The Use of Theory in Research on Broadening Participation in PreK-12 STEM Education: Information and Guidance for Prospective DRK-12 Grantees, written by members of the DRK-12 topical group on broadening participation in STEM. We're pleased to share news from DRK--12 projects and people, as well as our sister resource networks who serve other NSF funding programs (ATECentral, CAISE, CIRCL, CS for All Teachers, MSPnet, and STELAR). In addition to our newsletter digest, we disseminate your news items on our website and social media. Blog | In her blog, Zandra de Araujo writes regularly about the teaching and learning of mathematics. Publication | A new book edited by Victor Lee and Abigail Phillips, with chapters written by a number of DRK-12 awardees, offers cases and models for "understanding how physical libraries can incorporate and thrive as educational resources using new developments in technology and in the learning sciences." In the News | M. Alejandra Sorto will serve as an NSF program officer for the 2018-19 academic year. Thirteen thought leaders on STEM identify share their perspectives on informalscience.org. Virtual Reality in Educational Settings, written by Britte Cheng and Cynthia D'Angelo. Broadening Youth Participation in Computer Science & Engineering, written by Judi Fusco and Patricia Schank. Meet with NSF Program Officers Ellen McCallie, Sandy Welch, and Amy Wilson-Lopez on Tuesday, October 9 from 3 to 4 pm EDT or Bob Russell and Sandy Welch on Wednesday, October 24, from 3 to 4 pm EDT. Enter the competition by proposing a new "Big Idea" in STEM education for future investment by NSF. The deadline is October 26, 2018. Winners will be announced August 2019. NSF has published a term and condition for awards that will require awardee organizations to notify the agency of any findings or determinations that an NSF-funded PI or co-PI committed harassment. For other publication opportunities, including those with ongoing submissions, see CADRE's list of Publications for STEM Educators, Policymakers and Researchers. For more conference information, see CADRE's list of Conferences for STEM Educators, Policymakers and Researchers.